artful life: ...more Old Folks...TROLLS! I like to think of trolls as our original Earth guardians. They say in the beginning were the FROST GIANTS and from their toes came the races of humans, trolls, elves, dwarfs, gnomes and the rest of us humanoids. Trolls always seemed to be trying to keep the human rrace in balance; limiting access to wild spaces, protecting forests, hills and mountains mostly. No wonder they become outraged and stomp on village churches and try to scare humans away. Above is the King of Trolls. Notice the knots in his tail. They are a sign of importance and rank. The more knots, the higher the rank. This is the Troll Wanderer. 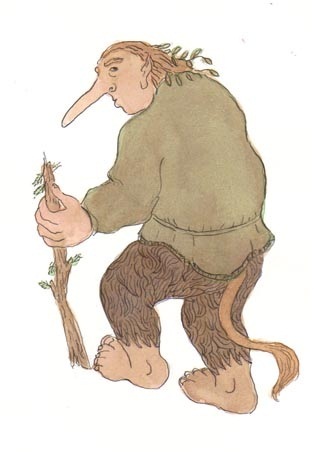 Many trolls are driven from their wild spaces by development and human over-population. Perhaps this wanderer doesn't have it in him to fight back, so he becomes a wanderer, always looking for a wild space to call his own and protect.